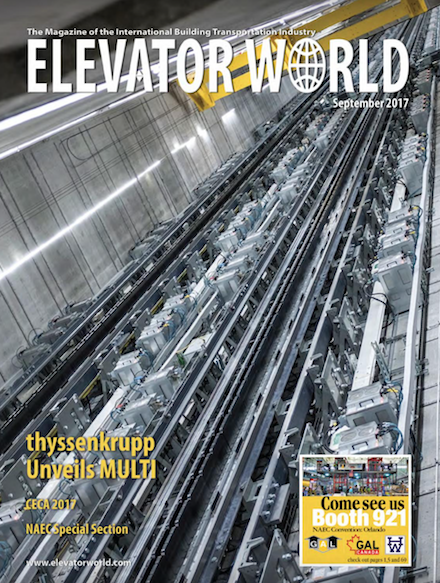 The following article appeared in The Elevator World Magazine in September 2017. Innovation, founder's vision and acquisitions fuel Delta Elevator's growth as company celebrates 50 years. It was 1956 when the Guderian family settled in Waterloo County, Ontario. Like many other immigrants from Germany, they were seeking to start a new life after the devastation of World War II. Walter Guderian was fortunate to arrive in Canada already having learned a trade — a trade that would be his career focus for the next 60 years. As an elevator mechanic, Guderian found employment quickly with Otis. After spending 10 years learning about the elevator industry in Ontario, his entrepreneurial spirit led him to leave the security of an established company to launch a business of his own. In 1967, Delta Elevator Co Ltd began. It is now celebrating 50 years in business. Over the next 37 years, Guderian served as president and guided Delta through many challenges: growing the customer base, hiring and developing employees and investing in infrastructure. Guderian retired in 2004, but still serves as chairman of the board and helps guide the company strategy. When Delta started, it was a one-man maintenance business that Guderian ran from his home. After stops in ever-larger facilities in Kitchener, Canada (on Louisa and then St. Leger Streets) the company grew into a full-service organization with three branch offices and more than 150 employees, including field staff, engineers and production workers. The head office and main operations continue to be located in Kitchener, and the company intends it stays that way. Today, Andrew Friedel serves as president and CEO. Friedel leads the senior management team responsible for Delta's strategy and operations. The business still has a small company feel and continues to adhere to the same values of integrity, service and quality that Guderian imbedded in the company's culture half a century ago. It is an approach that dates back to his apprenticeship in Germany, and it is something customers and employees still appreciate today. Delta remains a Canadian company that designs and manufactures its own products, including accessibility, LULA, freight and passenger elevators. John Guderian, vice president (VP) of Manufacturing, was instrumental in developing the company&apos;s lean manufacturing system. By manufacturing in-house, the company is able to provide architects and general contractors with customizable solutions and accommodate adjustments to building designs on the fly. The addition of mechanical and electrical engineering departments provided Delta with the technical expertise to invest in R&D on a continual basis. Mike Tikal, VP, Mechanical Engineering, has led the development of notable products including a LULA elevator (2004), machine-room-less elevator (2008), and various entrance systems. First released in 1999, Delta&apos;s distributed multiprocessor control controller has allowed the company to remain one of the few domestic suppliers of fully integrated elevator systems capable of providing customers with a true "Made in Canada" solution. Andrew Sinclair, VP of Electrical Engineering, has been responsible for its continuous refinement to meet current needs. In recent years, Delta established branch offices in Markham, Mississauga, Peterborough and London, Canada. Since 2000, administration, manufacturing, local field operations and the main parts depot for maintenance and service have been located in a more than 60,000 sq. ft. facility in Kitchener at 509 Mill Street. The facility has undergone two additions and substantial internal renovations over the past 17 years. Delta has also grown through acquisitions. In 2006, TriCity Elevator was purchased from Jeff Righton and integrated into Delta. While the acquisition initially provided a doorway to the residential high-rise market, it was the addition of Righton to the Delta senior management team that has proved to be the most beneficial aspect of the transaction. He is now VP Operations — Greater Toronto Area, Delta&apos;s fastest-growing branch. All of this growth has been funded internally, the same way that Walter Guderian grew the company in its early years. Delta&apos;s chief financial officer, Tim Fisher, is a strong proponent of this risk minimization approach and believes it is one of the reasons behind the company&apos;s success. As an active community member, Delta makes contributions to local charities on a regular basis, including the Grand River Regional Cancer Centre, the Food Bank of Waterloo Region, Supportive Housing of Waterloo and MennoHomes Inc. The company also supports the community by recruiting locally, promoting from within and hiring students from local universities and colleges. Since its inception, Delta has invested heavily in employee training, particularly developing its own tradesmen. As often as possible, the company grooms its elevator mechanics internally through the apprenticeship program. This results in apprentices who share the same values and have the necessary technical capabilities to be at the top of their field. In-house training facilities and programs ensure that once licensed, elevator mechanics remain expertly qualified. The company has always placed a high value on its employees and continues to do so today. There are more than a few employees with tenures exceeding 25 years, including senior management team members, maintenance mechanics and supervisors. Elizabeth Peters, VP Human Resources, who is one of these, has taken the lead role in ensuring social events like the annual golf days, long weekend barbeques, boat cruises, and Christmas parties help create a sense of family among the employees. Delta is a strong supporter of the elevator industry in general and has a long connection to the Canadian Elevator Contractors Association (CECA). Walter Guderian, past president, was one of CECA&apos;s founding members in 1973. It was very important to him to see the organization develop and become an effective part of the national elevator industry. More recently, Delta&apos;s VP of Field Operations, Brian Elliott, served as CECA president from 2015-2017 and was instrumental in its recent growth in membership and national influence on the development of a standard Maintenance Control Program for elevators. Today, Delta Elevator remains a family-owned business with deep roots in the community, and the company is looking forward to continuing to provide stable employment to its staff and excellent service to its customers for another generation.